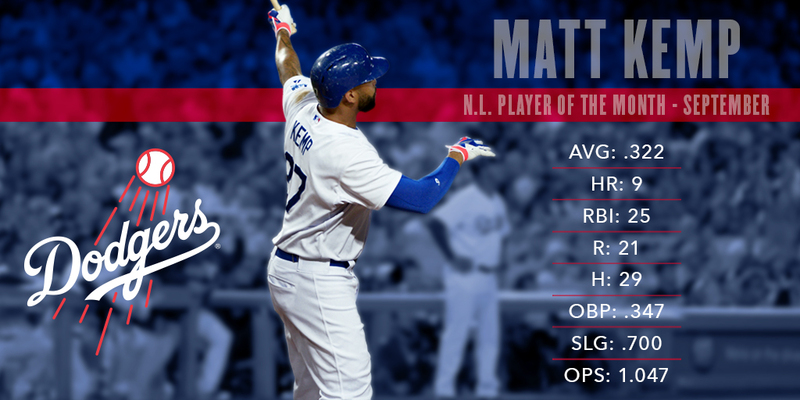 Matt Kemp, who in September led the National League in home runs (nine) and slugging percentage (.700) and was third in weighted runs created (192), was named the league’s Player of the Month. Kemp previously won this honor in April 2012. In August, he won his fifth NL Player of the Week award. In the second half of 2014, Kemp was No. 2 offensive player in the NL, according to Fangraphs, behind San Francisco catcher Buster Posey. Clayton Kershaw had a 1.95 ERA in September but fell short of his third NL Pitcher of the Month award for 2014, losing out to his opposing number for Friday’s National League Division Series opener, St. Louis righty Adam Wainwright, who had a 1.38 ERA. 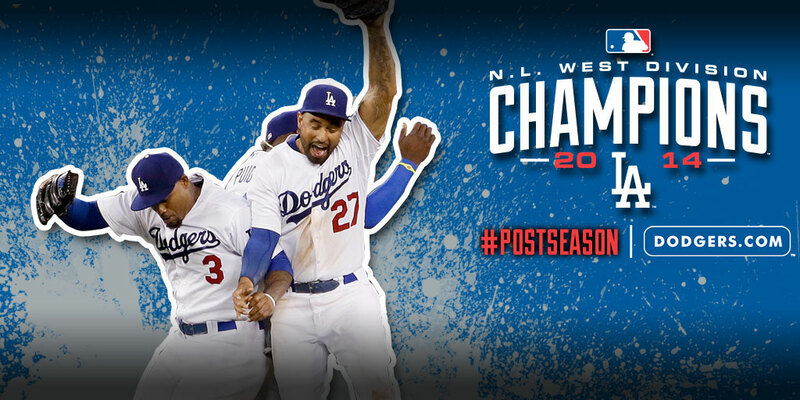 With the MLB playoffs comes the national spotlight for the Dodgers. With the national spotlight comes the attempts to tell the story of the Dodgers by those who only have a passing acquaintance to them, to those who only have a passing acquaintance with them. So for the benefit of baseball’s fans and media galaxy-wide, here are three storylines that are sure to be shared about the 2014 Dodgers — and the reasons why they are largely bogus. KLAC AM 570 has signed a multiyear agreement with the Dodgers to renew their radio broadcast rights for the team’s regular season games, select Spring training games and potential postseason games. The deal, subject to MLB approval, includes an equity position in the station for Dodgers owners as well as the opportunity to collaborate on programming. KLAC will also continue to provide pregame and postgame shows to the entire Dodger Radio Network, which includes 22 stations across the state and country. The Dodgers will open postseason play against the Cardinals at Dodger Stadium in Game 1 of the National League Division Series at 3:37 p.m. Friday, with Game 2 set for 6:37 p.m. Saturday. NLDS Game 1 is sold out. Extremely limited tickets are available for Game 2. On 570, Vin Scully will be on the air for the first three innings and last three innings of every Dodger playoff game, including road games. Charley Steiner and Rick Monday will handle the middle innings. Jaime Jarrin, Fernando Valenzuela and Pepe Yniguez will deliver the Spanish-language radio broadcasts on KTNQ AM 1020. Times for the remaining NLDS game(s) will be announced later this week. It’s inevitable that at some point before this week’s playoff rematch against St. Louis begins, Clayton Kershaw will be characterized as a postseason failure who comes up small in big games. The reasons for this will be 1) one victory in nine postseason appearances, 2) his pedestrian 4.23 career postseason ERA and 3) his disastrous outing against the Cardinals in Game 6 of the 2014 National League Championship Series. It’s one of the dwindling dividing lines between Kershaw and Sandy Koufax, even though Koufax himself didn’t win his first World Series game until he was almost 28. Kershaw’s first five postseason appearances (three in relief) were a mixed bag, but all of those came before his 22nd birthday. In his first postseason start — and first postseason showdown with the Cardinals’ Adam Wainwright — he held St. Louis to two runs over 6 2/3 innings in 2009 NLDS Game 2, the game the Dodgers eventually won, after Matt Holliday’s ninth-inning error, on Mark Loretta’s walkoff single. Subsequently, the 21-year-old lefty shut out Philadelphia over four innings in Game 1 of the 2009 NLCS before a meltdown in the fifth that led to five runs on three hits, three walks and three wild pitches. 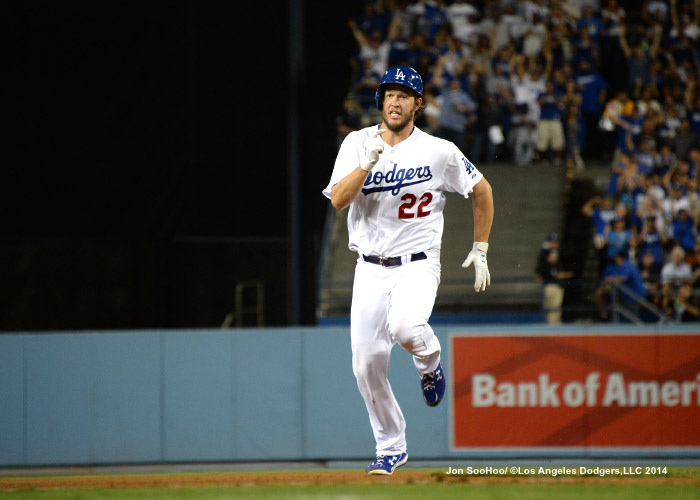 Move forward to 2013: Kershaw is about a month away from winning his second Cy Young Award as he heads into the playoffs. In Game 1 of the 2013 NLDS against the Braves, Kershaw allows one run on six baserunners while striking out 12 in seven innings. Coming back on three days’ rest in Game 4, Kershaw gives up no earned runs on four baserunners in six innings while striking out six. 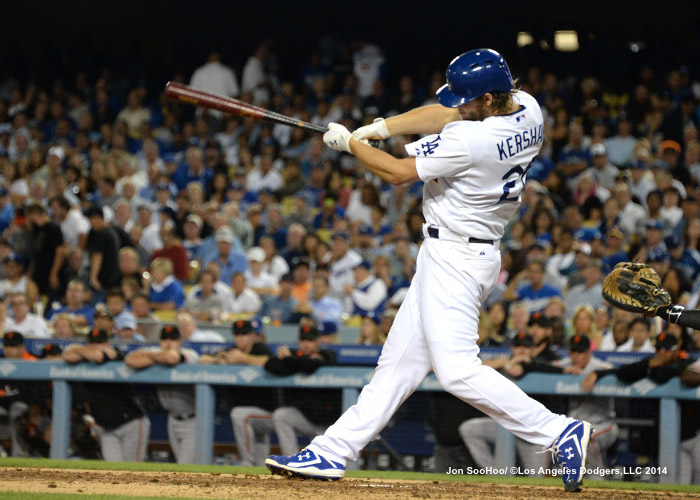 Two errors by Adrian Gonzalez deprive Kershaw of the lead and the chance at the victory. Then in Game 2 of the 2013 NLCS, Kershaw again allows nary an earned run on three baserunners while striking out five. Starting 2013 NLCS Game 6, Kershaw shuts out the Cardinals for the first two innings. To this point, in his first postseason opportunity since entering his prime, Kershaw had thrown 19 innings and allowed one earned run (0.47 ERA) and 13 baserunners while striking out 23. His career postseason ERA, even including the foibles of his youthiest youth, was 2.73. He had only one win to show for it, thanks to how little offensive or defensive support he was given in those games. But in the three biggest games of his 2013 season, Kershaw stood tall in each one. Over the next three innings of Game 6, Kershaw allowed seven runs, in the kind of meltdown we have only seen once in 27 starts since (against Arizona in May). Kershaw has been the first to take on all of the blame for this. No past event has loomed larger for the 26-year-old lefty this season, and certainly this week, than the Game 6 catastrophe. 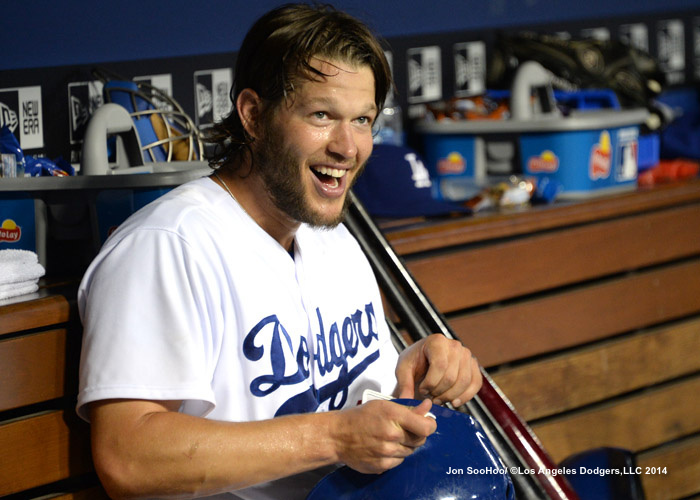 More than ever before, the 2014 playoffs will shape the perception of what caliber of postseason pitcher Kershaw is. It has become customary to expect something close to perfection out of Kershaw, especially since he expects the same from himself. But the absence of perfection does not mean failure. From 1988 to 2014: 94 wins — is it magic? Now let’s get ready for @Dodgers Playoff Baseball! With home runs by Matt Kemp, Adrian Gonzalez and Roger Bernadina, the 2014 Los Angeles Dodgers ended their regular season with their 94th victory, defeating the Rockies, 10-5. The last year the Dodgers won 94 games: 1988. 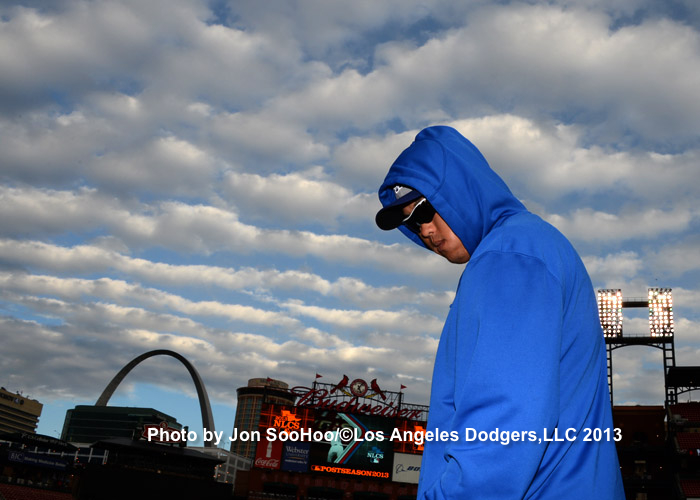 The arc of the NL playoffs points to Hyun-Jin Ryu making a start in St. Louis. Well, the opponent sure looks familiar, but things aren’t quite the same. Yadier Molina, C: Molina was sidelined from July 10 through August 29, but still managed to deliver a .333 on-base percentage in 445 plate appearances, a slight decline from his .359 OBP in 2013. His power took a steeper drop, from a .477 slugging percentage last year to .386 in 2014. Matt Adams, 1B: This is really Adams’ first full-time season, and he had a .321 on-base percentage while slugging .455 in 525 plate appearances. 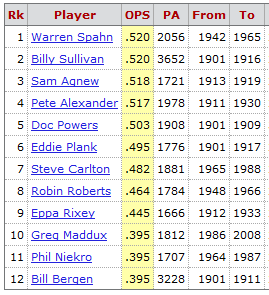 But he had a serious platoon split: .851 OPS vs. righties, .528 OPS vs. lefties. Allen Craig, Adams’ main alternative, was sent to Boston in the John Lackey trade. Kolten Wong, 2B: Wong, who turns 24 on October 10, managed a .294 OBP in 430 plate appearances. Former Dodger Mark Ellis was the primary backup, but the 37-year-old struggled to a .253 OBP and .213 slugging in 202 plate appearances. Jhonny Peralta, SS: Imported from Detroit, Peralta had a .336 OBP and .443 slugging with 21 home runs and 38 doubles. He was adequate against righties (.751 OPS) and strong against lefties (.879 OPS). Matt Carpenter, 3B: Truly a thorn in the Dodgers’ side since 2013. Remember that endless 11-pitch at-bat in Game 6 of the NLCS that precipitated Clayton Kershaw’s downfall? It was no fluke — Carpenter led the NL this year in pitches per plate appearance (4.37), as well as walks (95). Moving from second base to third base for St. Louis this year, Carpenter’s power went down (from an MLB-leading 55 doubles in 2013 to 33 this year), but he remains a tough out. Matt Holliday, LF: A veteran of the Dodger-Cardinal playoff battles, Holliday had a .370 OBP while leading St. Louis in OPS (.811). In the second half of the season, his OPS was .882. John Jay, CF: Like Carpenter and Holliday, Jay boasts a .370-plus OBP, boosted not insignificantly by an NL-high 20 hit-by-pitches. Also grabbing playing time in center is defensive standout Peter Bourjos, who only had a .297 on-base percentage but hit a game-tying, two-run home run off Clayton Kershaw on July 20. Randal Grichuk, RF: Right field has been a bit of a grab bag for St. Louis since the Craig trade, though Craig himself was hardly lighting it up. Jay sometimes moves over to right when Bourjos is in center. Grichuk, 23, is OBP-challenged but has shown some power with 10 extra-base hits in 106 at bats. He appears to have supplanted 22-year-old Oscar Taveras, who with a .598 OPS hasn’t been much of an answer. Daniel Descalso, UT: What appears to be a fairly meek Cardinals bench is led by Descalso, who has a .333 OBP while slugging .310. He reached base 16 times as a pinch-hitter, but that was in 54 plate appearances (.302 OBP). Summary: St. Louis does get on base at a decent rate (.321 OBP, fourth in the NL), but the Cardinals are 10th in the league in slugging percentage and 15th in home runs. Carpenter, Holliday and Peralta lead an offense that doesn’t appear that strong top to bottom, but its peskiness remains a threat. Deciding the Dodgers’ first playoff opponent came down to the final day, but not the final game. Cincinnati ace Johnny Cueto shut down Pittsburgh on one run in eight innings today, but it was his unlikely RBI single in the bottom of the eighth that broke a 1-1 tie and put the Reds ahead to stay in 4-1 victory over the Pirates, handing the National League Central title to the St. Louis Cardinals and setting up a playoff rematch for them with the Dodgers. For more photos from Saturday, visit LA Photog Blog. Bullet points seem like a nice way to go for Game 162. Don Mattingly said everyone is optimistic that Dee Gordon, who left Saturday’s game with a sore hip and had an MRI, would be ready Friday for Game 1 of the National League Division Series. Hanley Ramirez had no ill effects today after fouling a ball off his knee Saturday. Hyun-Jin Ryu had a successful bullpen session today. Assuming no setbacks Monday, he would be set for a midweek simulated game and on track to start Game 3 of the NLDS on October 6. Mattingly was a bit coy about what manager-for-the-day Juan Uribe would actually do today, but one thing he was clear about was that nothing would be done to embarrass any players or umpires. Any arguments, for example, Mattingly will handle. But while Uribe will be given guidelines about who to play and for how long, it does appear strategic decisions will be left in Uribe’s hands. Uribe himself will not play. Similarly, pitching coach du jour Clayton Kershaw will have a schedule of who is supposed to get work behind Zack Greinke, but he presumably will be the one going to the mound to make any moves or talk shop. Kershaw himself threw about 30-odd pitches in a simulated game to keep himself fresh. Mattingly joked that he was going to check to see if he and Uribe would be switching salaries for the day. Going into play today, Gordon led the MLB stolen-base race by eight and in triples by two. Adrian Gonzalez led Mike Trout in the drive for the big-league RBI crown by two. Stephen Strasburg and Johnny Cueto did end up passing Kershaw on the NL strikeout list. Scott Van Slyke had four stolen bases in his Major League career before he added two more on Saturday – both of which were mere prelude to his game-winning dash home on a wild pitch to give the Dodgers a 6-5 victory over Colorado in 12 innings. So while the baserunning bonanza wasn’t typical of Van Slyke’s contributions to the Dodgers, the sneakiness behind it was. Almost completely under the radar, Van Slyke has put together the top offensive season by a reserve in Los Angeles Dodger history. For more photos from Friday, visit LA Photog Blog. After a season of putting opposing hitters to bed, Clayton Kershaw is going to try it with one of his own. The secret of Clayton and Ellen Kershaw has been passed along by Bill Shaikin of the Times — they’re going to have a baby girl in January. The due date comes roughly two months before Kershaw’s 27th birthday and about a month before pitchers and catchers report to Spring Training. In the much nearer future, Kershaw will be the Dodgers’ pitching coach Sunday while Juan Uribe takes on managing duties, as Don Mattingly continues the recent tradition of handing over the reins to players for the last regular-season game of the season. Uribe was one of those who greeted Dodger minor-league pitcher of the year Julio Urias on Friday. 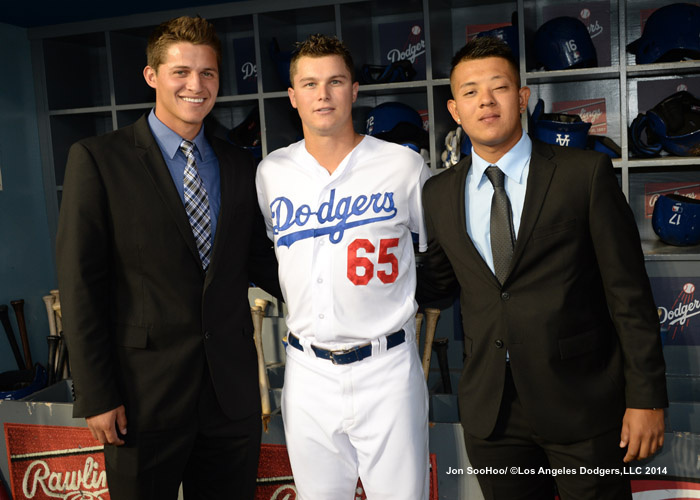 Urias and co-minor-league players of the year Corey Seager and Joc Pederson were honored before Friday’s game. For more photos from Wednesday, visit LA Photog Blog. Though I joked on Twitter about the kind of lineup the Dodgers might send out this weekend, my suggestion of starting pitcher Drew Butera was rejected by Don Mattingly. In fact, the Dodger lineups figure to be fairly conventional, out of the desire to keep players fresh and the realization that everyone will have four days off between the end of the regular season and Game 1 of the National League Division Series against either St. Louis or Pittsburgh at Dodger Stadium on October 3. 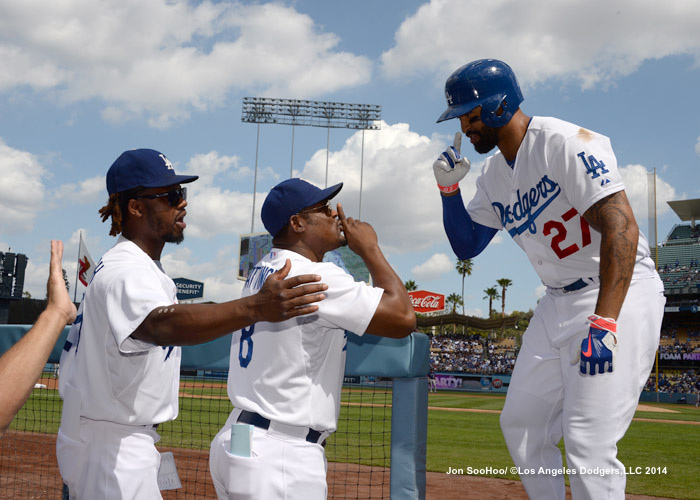 Most if not all players will rest one of this weekend’s three games against Colorado — Hanley Ramirez, Matt Kemp and A.J. Ellis start on the bench tonight — and those who do start might not play the whole game. But by and large, you’ll see your favorite Dodgers if you come out or tune in. The fun twist in tonight’s starting nine is the second career start as a cleanup hitter for Justin Turner. Turner’s only previous start as the No. 4 batter came 364 days ago, in his final start with the New York Mets. Turner went 2 for 4. Don Mattingly told reporters today that Dan Haren and Zack Greinke are on schedule for starts Saturday and Sunday, though they will each be on a pitch count. There are five days of rest for Greinke between Sunday and Game 2 of the NLDS on October 4. Haren will be off longer, even if he ends up starting NLDS Game 3 on October 6. Hyun-Jin Ryu continues to progress toward that Game 3 start, however. He threw off a mound in the bullpen today for the first time since his second-inning exit against the Giants exactly two weeks ago. Mattingly said that if there are no setbacks, Ryu would have another bullpen session Sunday, followed by a simulated game sometime next week, as he progresses toward a return to action. Team of destiny, or team of doom? Well, here we are at the end of the 1988 regular season, and pennant fever is high in Los Angeles. And why not? 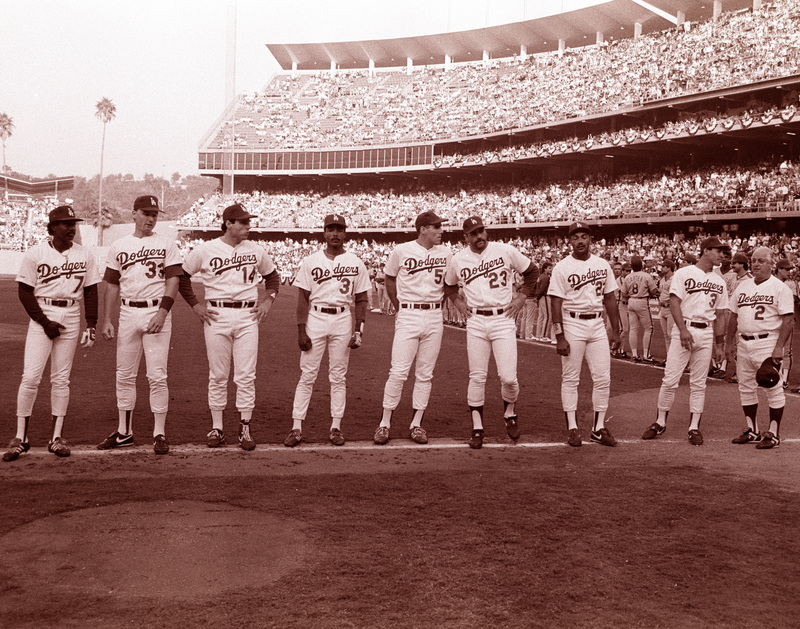 It’s been seven long years since the Dodgers went to and won the 1981 World Series. 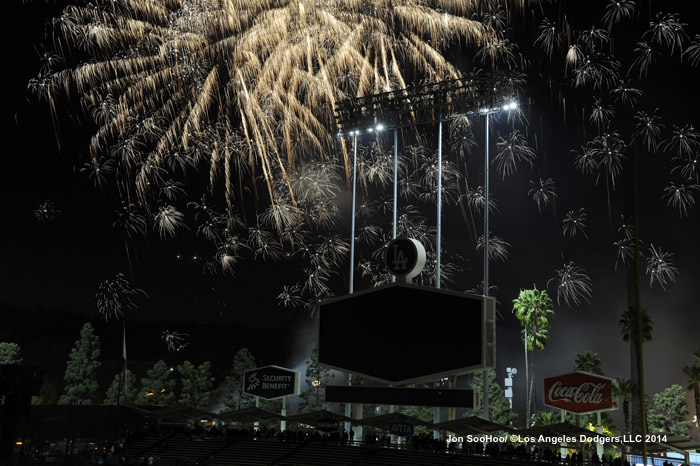 In the 26 years since Dodger Stadium opened, the Dodgers remain stuck on seven trips to the Fall Classic — barely one every four years — and a mere three World Series titles. That kind of drought just isn’t the Dodgers’ style. Now, led by shutout streaker Orel Hershiser and the gritty but productive Kirk Gibson, the Dodgers are back in baseball’s Final Four, four games away from a National League pennant and eight games away from a parade. There’s no limit to what the Dodgers can do in the coming postseason. This is really just a slice of what an awe-inspiring resume Clayton Kershaw has put together. • Kershaw leads all players in Wins Above Replacement, according to Baseball-Reference.com. • Kershaw will be the first player to lead the Major Leagues in ERA for four years in a row. • Kershaw has the highest strikeout-walk ratio in the National League in the past 10 seasons. • Kershaw leads the Majors in adjusted ERA (197 ERA+), fielding-independent ERA (1.80), xFIP (2.07), WHIP (0.86), opponents’ OPS (.523), opponents’ OBP (.233), strikeouts per nine innings (10.8), strikeout percentage (31.9 percent), average game score (70) and pitches per inning (13.7). • Kershaw took the mound for 199 different innings this year (197 full innings, plus two in which he was replaced with two out). He pitched scoreless baseball in 172 of them. In 27 starts this year, Kershaw has allowed earned runs in only 25 different innings. • In his past 1,000 innings, Kershaw has a 2.17 ERA with 1,051 strikeouts — 9.5 strikeouts per nine innings compared with 2.1 walks per nine innings. • Of the past 1,000 batters he has faced, only 238 have reached base. • Kershaw is underpaid. 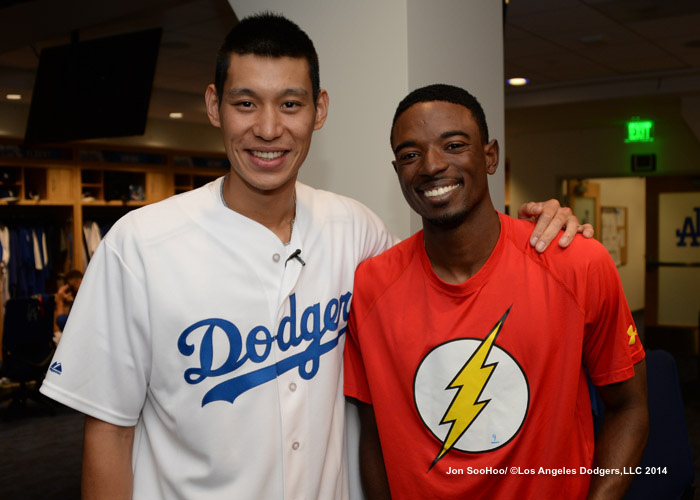 Fangraphs values his 2014 season at $39.8 million. • Kershaw pitched at least eight innings in 15 of his starts. That’s more than all but three other teams: Cincinnati (18), Detroit (17) and Oakland (16). • Kershaw allowed two runs or less in 19 of 27 starts, three runs or less in 26 of 27 starts. • Opponents have hit below .200 against Kershaw each of the past two years. His opponents’ batting average went from .195 in 2013 to .197 in 2014, even though his luck worsened — his batting average on balls in play went up from .255 to .284. • Kershaw’s opponents’ OPS for the past two seasons (1,657 plate appearances) is .522. Only 12 players in MLB history with at least 1,650 plate appearances have had OPS that low: eight pitchers and four catchers. In other words, Kershaw has turned his opponents into absolute worst hitting players of all time. • Kershaw has faced 749 batters and fielded for 198 1/3 innings. In that time, Dodger opponents scored 42 runs. • Kershaw leads National League pitchers in defensive runs saved. • Kershaw has won the Dodgers’ Roy Campanella Award two years in a row and is nominated for his second Roberto Clemente Award. 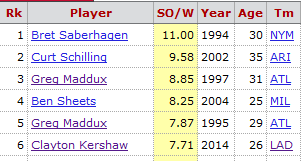 Update: Kershaw is seventh in MLB history in strikeouts before turning 27. • Kershaw is third in MLB history in strikeouts per nine innings before turning 27, behind only Nolan Ryan (9.68) and Pedro Martinez (9.59). 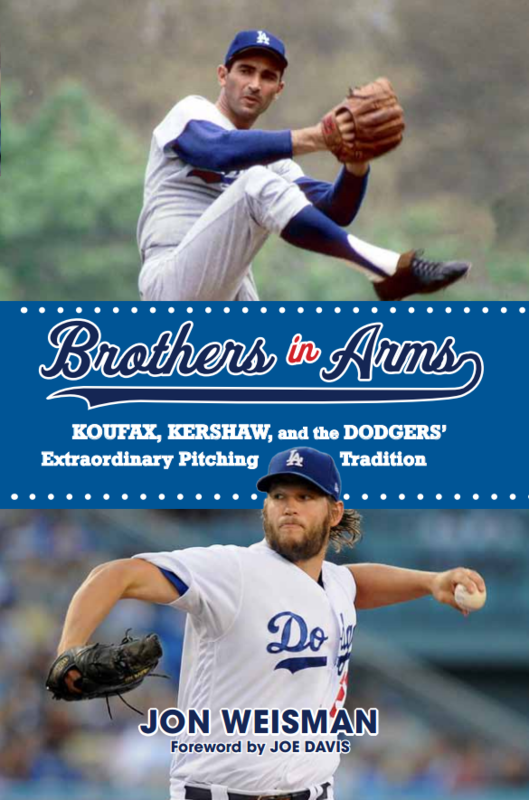 Update 2: Kershaw now has more career games (eight) with no walks and at least 10 strikeouts than any Dodger, including Sandy Koufax, notes Lee Sinins at Gammons Daily. Update 3: Kershaw held opponents to three runs or less in 96.3 percent of his starts, the best percentage in MLB history. • In his 198 1/3 innings, Kershaw loaded the bases twice. • In his 27 starts, he allowed 23 hits with runners in scoring position. • In the eighth inning, when Kershaw should have been tiring, opponents had four singles and no walks in 48 plate appearances, for an .083 on-base percentage and slugging percentage. • Against winning teams, Kershaw had a 1.65 ERA, 0.89 WHIP, 10.3 strikeouts per nine innings and a 8.8 strikeout/walk ratio, averaging 7.8 innings per start. • Kershaw pitched to 340 batters in road games. Two of them homered. • Kershaw hit more triples at Dodger Stadium in 2014 (one) than he allowed (zero). • Even if you removed his 41-inning scoreless streak from his 2014 record, Kershaw’s ERA of 2.23 would lead the National League. • Kershaw’s last intentional walk? May 3, 2013. In case of NL West title, break glass! Wednesday, September 24, 2014, 6 p.m. 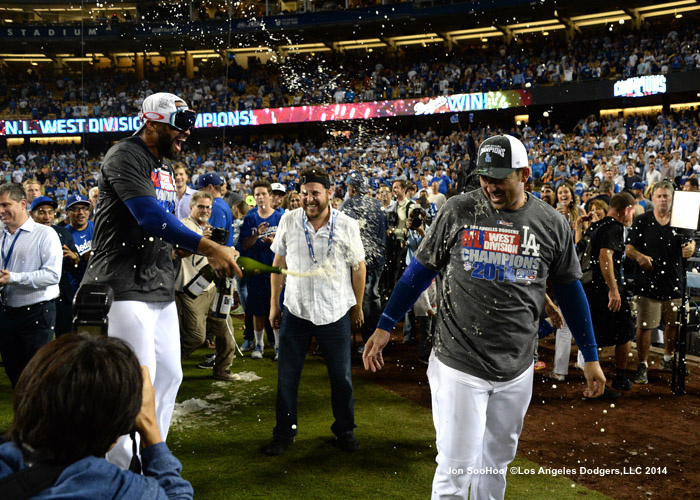 If you’re reading this, then the Los Angeles Dodgers have clinched the 2014 National League West title, automatically activating the Opposite-of-Doomsday Dodger Insider Publications Scenario. I can only imagine the wonders of the world you are living in, thousands upon thousands of seconds in the future. No doubt you travel to and from Dodger Stadium by jetpack, and the bioscience industry has invented cures for all the world’s ills. For you, the NL West race is a thing of the past, a tale of yore, and no doubt details have grown fuzzy and obfuscated over the passing minutes. But while still deep in that ancient time, I wanted to preserve some details and remembrances — a primary source if you will. So whisk the dust off the long-ago, and recall with me these memories of the Dodgers’ 2014 regular season.